Bodybuilding.com's ambassadors help spread the message of fitness far and wide. This month we turn the spotlight on obstacle course race enthusiast Blake Cobb. 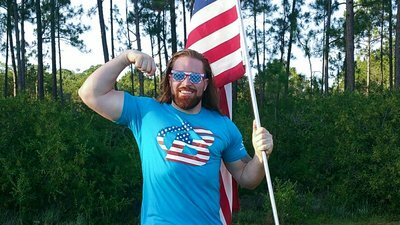 Bodybuilding.com ambassador Blake Cobb encountered difficult obstacles long before he entered a Spartan Race. First, there was a back injury. Then came a divorce; after that, depression. He bounced back, though, a rebirth he attributes to his Christian faith and the gym. "The gym was where I could exert the negative energy and use it to build something up, instead of using it to tear something down," says Cobb. "I blocked out the world and just pushed the weights. Once I began to see results, I fell in love with it." Before you assume that he's just another average, iron-obsessed bro, Cobb has since discovered a much different avenue of exhibiting physical skill and strength: obstacle course races (OCR). Nothing has made him feel alive or want to test himself more than these crazy displays of functional strength, endurance, and unconventional skill. And he loves that it sets him apart from the crowd. "Bodybuilding.com has so many athletes who have extensive backgrounds in their respective sports," Cobb says. "I'm still learning how and where I fit in. But if my immediate love for OCRs is any indication, I think I've found my niche." Cobb is a reminder that our past may influence where we are today, but navigating the obstacles head-on may just lead us to true fulfillment. Do you have any background in fitness? I was hyperactive as a child. I played Little League Baseball and spent the rest of my time riding bikes, rollerblading, doing gymnastics, and jumping on a trampoline. The highlight for me was wrestling in junior high. I loved the competition. In the summer of 2002, after my senior year of high school, I injured my back while playing pickup football. Subsequently I was diagnosed with two herniated discs. The pain was too much to deal with, and I stopped being active for a long time. What happened after you injured your back? How did you start getting active again? In 2015, I went through a difficult bout with depression. I dropped a lot of weight in a very unhealthy way, so I turned to the gym as a way to get myself back to mental and physical health. A few months into this new journey, I learned about Bodybuilding.com. I joined the BodySpace community and participated in a transformation challenge as a way to hold myself accountable. After that, I completed the Shortcut to Size program by Jim Stoppani, Ph.D. I loved the results and I've been all-in with Bodybuilding.com ever since. What were some big moments that led to you becoming a Bodybuilding.com ambassador? In 2016, I registered for the Spokesmodel Search and made it to the semifinals! It was a huge milestone for me. And earlier this year, I made it into the pages of TRAIN Magazine, which featured me in its transformation section. I now have my heart and mind set on landing a cover feature! How has being a Bodybuilding.com ambassador changed things for you? My training hasn't changed much since becoming a Bodybuilding.com ambassador, but it is more important for me to be more consistent. Stepping into this role has given me a greater platform to reach more people, and I want to be a positive role model for others. As I've continued to learn and grow, I have found new ways to push myself. My newest thrill, and something I've become pretty passionate about, is obstacle course races, including mud runs. What makes these OCRs particularly thrilling for you? I enjoy the adrenaline rush I get from the obstacles and the competition. With OCRs, most races require some level of teamwork, even though you're competing as an individual. So, you may be lending a hand or receiving help from a fellow racer who you've never met. One thing I won't ever forget is the feeling I experienced once my first race was done. I was riding this amazing high and felt hooked! You just competed in your first Spartan Race this year. What was that like? My first Spartan Race was an incredible experience. I ran the Spartan Sprint, which is a 3-5-mile race featuring more than 20 obstacles. I was more physically ready for this race than any other I've ran so far this year, and I could tell I was going to do well by the time I reached the first mile. I liked how the obstacles were more task-oriented. I had to complete certain tasks (throwing a spear at a target, climbing a rope, carrying a sandbag) in order to keep going. Another unique thing about Spartan Races is that if you're unable to complete a task, you must do 30 burpees instead. I made it a goal to complete the race without doing any burpees, and I'm proud to say I accomplished that goal! When I don't have a specific goal coming up that I need to get ready for, I don't count or track any of my food. I eat what I want, but make healthy choices when I need to. For breakfast, I eat egg whites with a little bit of cheese and either turkey or veggie sausage and a cup of coffee. If I'm leaning out, I'll cut out the cheese and the coffee creamer. Typically, I don't have a lot of time to cook, and I'm not the greatest at it, either. So, it's easier for me to prep for the week ahead and for the most part eat the same thing every day. Usually it's chicken breast and either Brussels sprouts, asparagus, or spinach. Sometimes I'll add in sweet potatoes or wild rice. Dinner is often the same thing. My favorite part of being a Bodybuilding.com ambassador is getting to represent the company that helped me reach my goals when I felt lost along my journey. I love pointing people to programs and products that have been beneficial in my growth. These are products and a brand I really believe in and actually use. I also love the community that revolves around Bodybuilding.com. Making connections and building relationships within this group of people is such a wonderful thing, and I'm grateful for the men and women I've been able to do that with. What are some of your hobbies outside of fitness? Hiking, drawing/sketching, listening to entrepreneurial podcasts, and, sadly enough, binge watching my favorite shows on Netflix. Where do you see yourself taking this fitness lifestyle in the future? Ultimately, I want to pursue modeling. It's not necessarily tied to fitness, but it would require more of me as far as working on my physique goes. I also want to get more involved in the OCR community, do more races, and challenge myself to compete on the elite level. A third idea I have is to create my own clothing line for all lifestyles, not just fitness. And finally, something else that's been on my mind lately is potentially opening my own gym.